Losing football matches can sometimes become a habit as tricky to shake as the winning addiction Liverpool operated with during the second half of 2018. The cup loss at Wolves on the back of their reverse at City is set to be a footnote in the Reds' season, but it would only have been human to feel nerves when this game was goalless at the interval. But they can relax again, for now, in the knowledge that City lost twice in December when they played later in the matchweek than Liverpool. Brighton's faultless defensive organisation got them through the first half with relatively few worries. At that point, Salah decided to take matters into his own hands. In the period immediately after the break – either side of winning and netting the game-breaking penalty – the superstar forward dropped deep and roved, breaking lines and Albion's otherwise unwavering concentration. 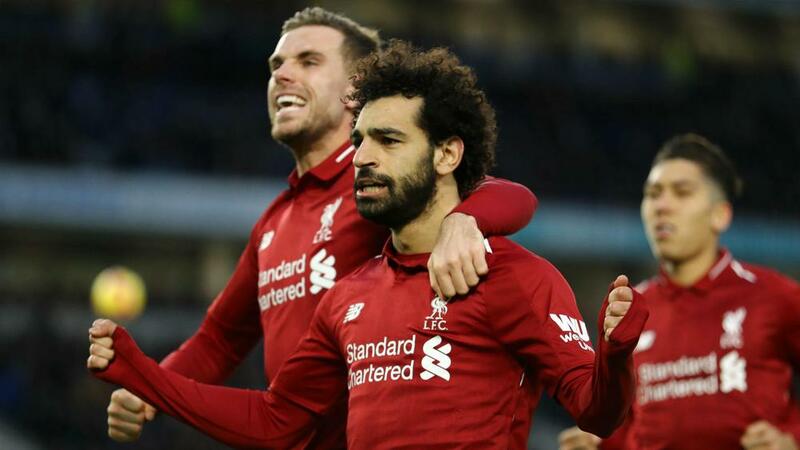 He elevated himself above everyone else on the field to get Liverpool's title charge back on track. Chris Hughton's ploy of targeting the right-hand side of Liverpool's defence – where Alexander-Arnold appeared short of full fitness outside Fabinho – might have borne fruit had Locadia displayed a surer touch and avoided straying offside at untimely moments. If two goals in as many games after Christmas were a couple of steps forward for the ex-PSV forward, this outing was one backwards. Liverpool welcome Crystal Palace and their former boss Roy Hodgson to Anfield next weekend, when Brighton face another tough test away at Manchester United.